From your sunny perch at Crescent Towers I 304, your family can enjoy a gorgeous oceanfront view of the inviting Atlantic Ocean. Whether it is with your morning cup of coffee or your happy hour cocktail, you will marvel at the feeling of relaxing on your own private balcony. 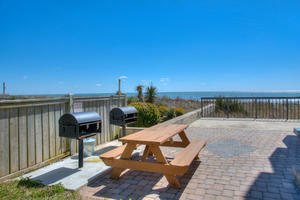 A coastal breeze blows through your hair and a salty scent hangs in the air when you vacation at this oceanfront condo in North Myrtle Beach, South Carolina. 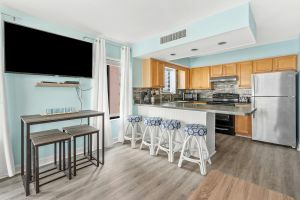 Enjoy the spacious accommodations at this North Myrtle Beach vacation rental, where this two bedroom, two bath oceanfront condominium makes your family feel right at home. The colorful interiors brighten your vacation days at this oceanfront condo rental. Comfortable furnishings include nice living room furniture, kitchen with dishwasher and breakfast bar, and a DVD player for an occasional movie night at Crescent Towers I 304. 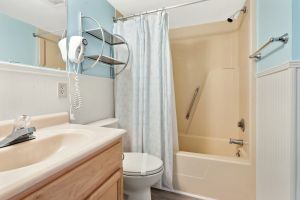 A washing machine and clothes dryer in this oceanfront condominium are supremely convenient amenities you will have when you vacation at this North Myrtle Beach vacation rental. An inviting feature at Crescent Towers I is the pool deck where lounge chairs surround a sparkling swimming pool. 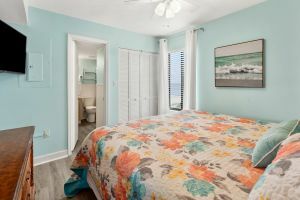 When you vacation in North Myrtle Beach, South Carolina much of your time is spent outside, either at the beach or near the swimming pool, and this North Myrtle Beach vacation rental makes it easy for you to have both options readily available. 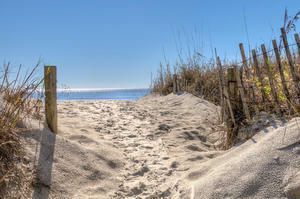 Follow the beachfront path to enjoy a day on the beach because the Atlantic Ocean is just across the dune line. Spending a family vacation at the beach does not get much easier than this. 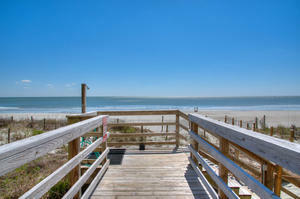 Grab your beach towel, sunscreen and sunglasses and head out your door for a quick elevator ride to the sandy beach. 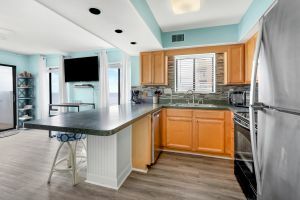 Because this oceanfront condo rental is right on the beach, you can conveniently return to your North Myrtle Beach vacation condominium for a fast bite to eat or a refreshing beverage. 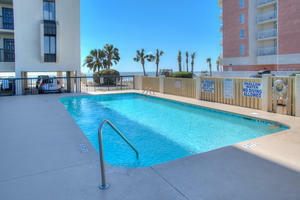 Life is good and living is easy when you vacation at Crescent Towers I 304. Plus, the most popular family attractions and entertainment are in close proximity to Crescent Towers I 304! Go SCUBA diving, rent a Sea Doo and ride the ocean waves, charter a fishing boat and shop until you drop at all the outlet stores in the area. Myrtle Beach has live theatre entertainment with musical productions for all ages. World-renowned sculpture gardens, Lowcountry tours and boat rentals await you when your North Myrtle Beach vacation brings you to Crescent Towers I 304.